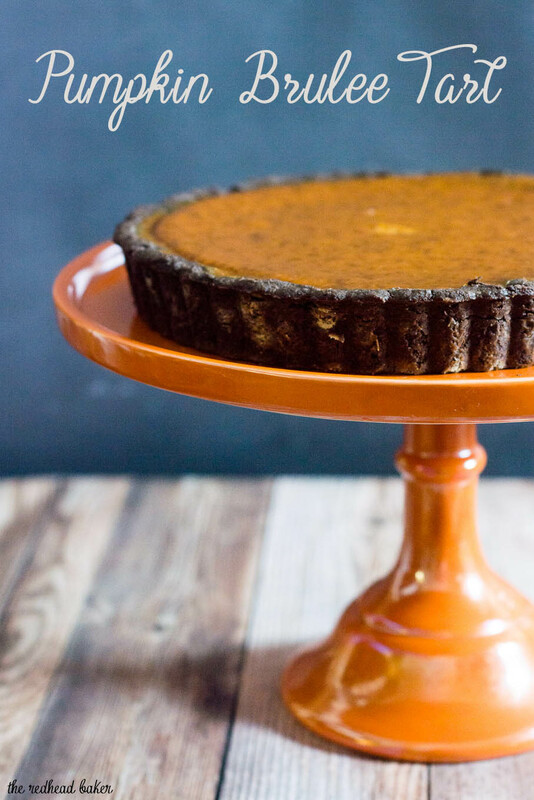 Move over, classic pumpkin pie! 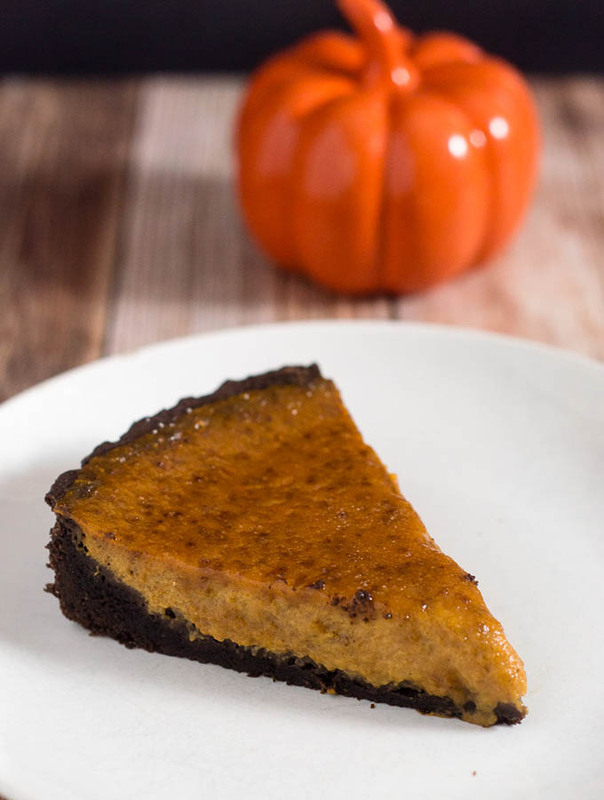 Pumpkin brulee tart has a custard-like spiced pumpkin filling baked in a dark chocolate tart shell with a bruleed sugar topping. 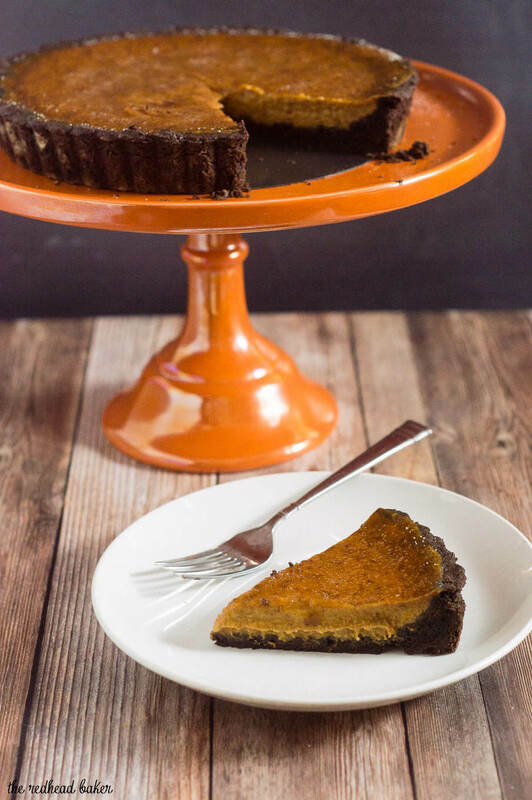 Welcome to Day 1 of #PumpkinWeek, hosted by Terri of Love and Confections! 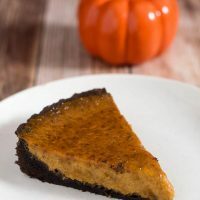 After you check out my pumpkin brulee tart, don’t forget to scroll down to the bottom of the post for links to more pumpkin-filled recipes by other bloggers. Pumpkin pie is a classic American dessert. Almost everyone loves the warmly-spiced custard-like filling, with the buttery, flaky crust, served with a dollop of sweet whipped cream. It’s a Thanksgiving staple. Some people like to see the classics on the table year after year. Personally, I like to change things up each year. 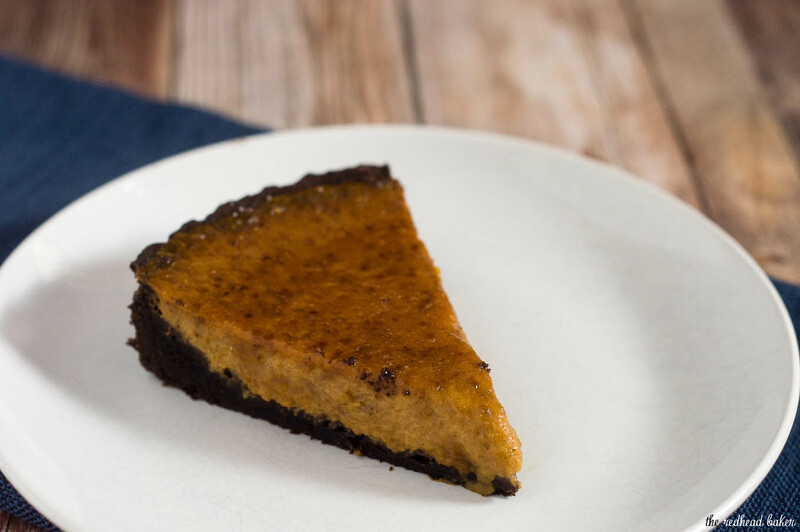 This pumpkin brulee tart is familiar while being just a little bit different. Pumpkin brulee tart combines the delicious silky custard and crunchy burnt sugar of creme brulee and the ease of a tart. No special creme brulee dishes or water bath required! This recipe does bake in a tart pan with a removeable bottom, but if you bake tarts or quiches at all, it’s a helpful pan to have. 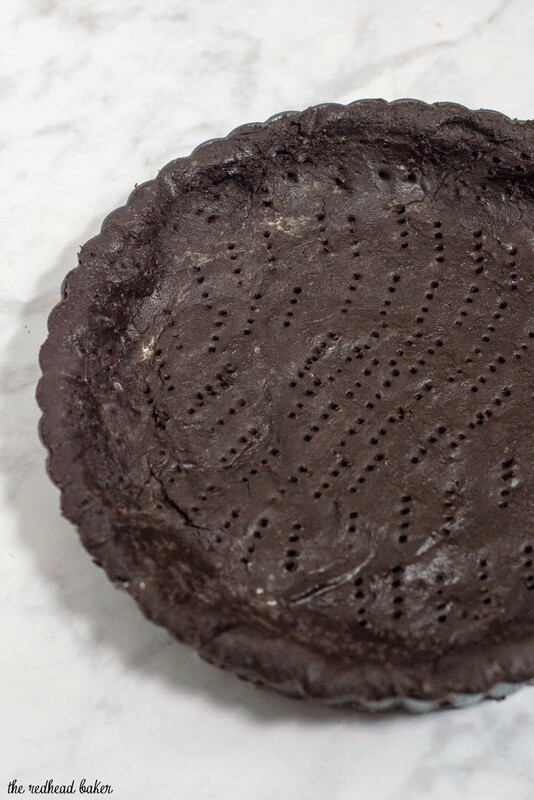 It starts with a dark chocolate tart crust. If you can’t find dark cocoa powder, regular is fine, it just won’t have as intense a chocolate flavor. Be sure to prick your tart shell all over with the tines of a fork to prevent it from bubbling up during baking. It will puff up a bit even when docked, but will be fall back down when cooled. After the tart is completely baked, place the tart pan on top of a sturdy can. The can supports the bottom of the pan while the sides fall to the table, making it easier to slice the tart. The fluted sides make for a pretty presentation. The directions say to bake for 20 to 40 minutes. Yes, that is a much wider range than you’ll see in most other recipes, but the baking time depends on the thickness of your crust, and the temperature of your oven. Just let it keep going until the edges are puffed and the center just barely jiggles when you gently shake the pan. It is essential that your baked tart is thoroughly chilled before bruleeing. 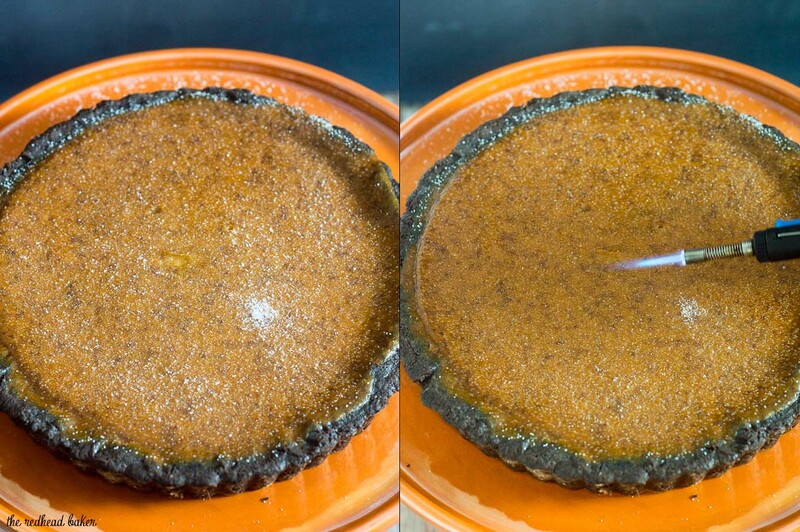 If it’s not cold enough, the sugar you sprinkle on to brulee will simply be absorbed into the custard filling. Don’t rush this tart! Make it a day ahead of when you plan to serve it, and let it chill overnight. 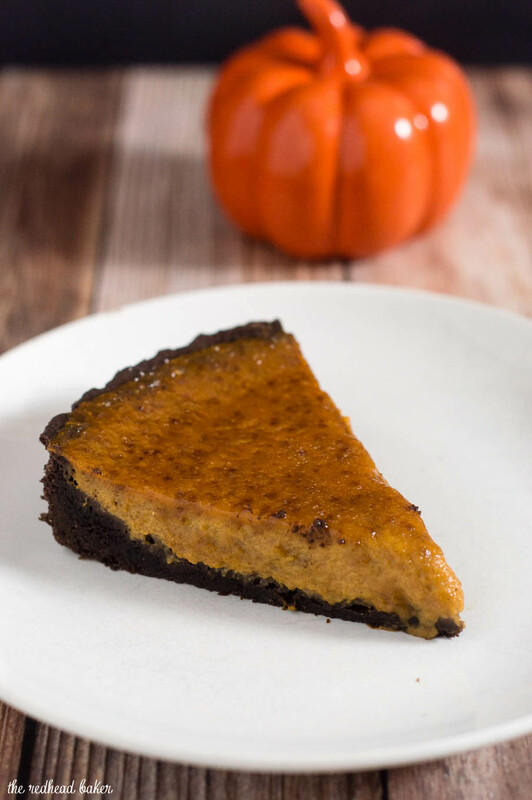 Pin this recipe for Pumpkin Brulee Tart for later! Make the crust: place the flour, cocoa powder sugar, and salt in a food processor. Pulse a few times to combine. Add the butter, and pulse a few times until the mixture resembles coarse crumbs. Add the yolk and vanilla, and process continuously just until the mixture comes together (no more than 30 seconds). Scrape the dough onto a sheet of plastic wrap and press into a disc. Wrap tightly and refrigerate for about an hour. On a lightly floured surface, roll out the tart dough to 1/8 inch thick. Brush off excess flour with a pastry brush. Carefully transfer dough to an 9-inch fluted tart pan with a removeable bottom, pressing it into edges and sides; trim excess by running rolling pin over the pan. Prick the bottom of the dough all over with a fork. Cover with plastic wrap, and chill in refrigerator at least 1 hour. Preheat your oven to 375 degrees. Remove pan from refrigerator, and place on a rimmed baking sheet. Line with a piece of aluminum foil that overhangs the edges by at least 2 inches. Fill foil with pie weights or dried beans; fold foil to enclose, making sure edges of tart are supported by the foil and weights. Bake for 20 minutes, or until the foil no longer sticks to the crust. Remove foil and weights; continue baking another 5 minutes. Transfer to a wire rack to cool completely. While the tart shell is cooling, make the filling: whisk all of the ingredients (except the extra sugar for bruleeing) until well-blended and smooth. Reduce the oven temperature to 325 degrees. Pour the filling into the cooled tart shell. Depending on the thickness of your tart shell, you may have filling left over. Discard it, make a second crust and bake, or pour into creme brulee dishes and bake. Bake for about 20 to 40 minutes, rotating 180 degrees halfway during baking, until the edges of the filling are puffed, and the center is just barely set. Cool to room temperature, then chill in the refrigerator until set, at least two hours or up to 2 days. Just before serving, evenly sprinkle a thin layer of granulated sugar over the top of the tart. Use a kitchen torch to brulee the sugar until it melts. Let the melted sugar harden before slicing and serving. I love this new version of pumpkin pie! My family loves the traditional recipes, as do I, bu I love to try new things as well! Just love that dark chocolate crust. Much more elegant than pumpkin pie. Just look how dark and chocolaty that crust is! I would be super happy to have a slice for Thanksgiving or any time!